The digital textile printing market has been growing rapidly for many years. Companies that adopted dye sub printing early in its development are now seeing market maturity and high competition. So how do you stay ahead of the masses instead of just keeping pace? Offer something new – striking, seamless, 5-meter fabric. Step into a wide open market. Almost every PSP already owns a UV printer as well as a solvent or latex printer. 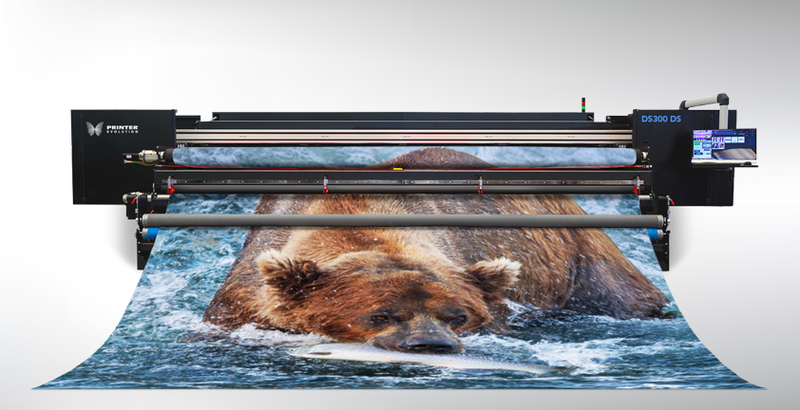 Dye sublimation fabric printers have been one of the most rapidly adopted technologies in the last seven years, which is driving increased competition in this market space. But there are still unique, low-competition spaces in the digital textile market. By becoming one of the few PSPs to offer 5-meter fabric in the US, you have the opportunity to enter the field with almost no competition. A seamless, sixteen-foot-tall fabric display is a truly beautiful and incredibly unique sight to see. 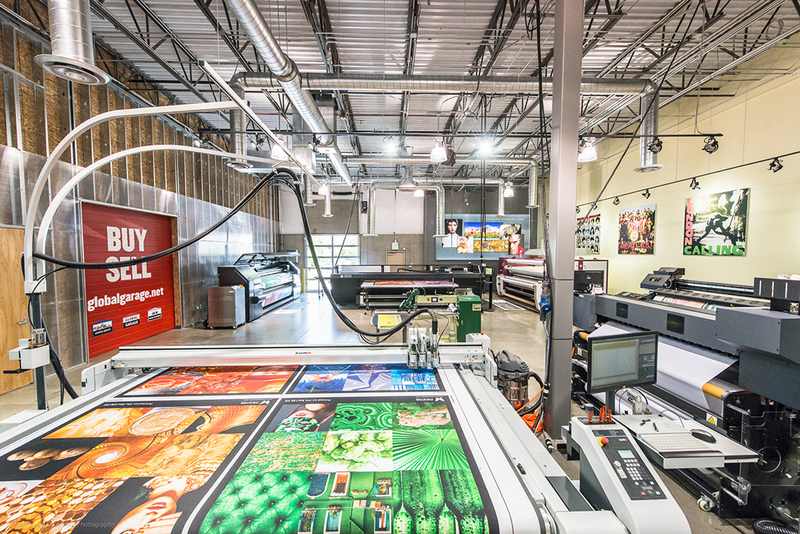 Since 5-meter fabric printing is very new in the US, with less than 6 known installs to date, you can offer your customers something your competitors can’t. If you’re wondering why there are so few 5-meter printers installed in the US, it really comes down to three barriers: They require a substantially larger footprint, they are more expensive, and the rolls are exponentially heavier. The PrinterEvolution D5300 DS, a 5-meter, direct-to-fabric dye sub printer with a built-in calender, deftly avoids the constraints that typically come with a printer of this size. We surveyed our customers and established that a textile printer paired with an offline calender takes 40% longer to produce a finished print than a printer with an inline calender. * Most of this decreased efficiency occurs after printing, when the roll of fabric has to be unloaded, transported to the calender, loaded onto the calender, and run through sublimation. In contrast, a printer with an inline calender simply prints and sublimates the job in a single step. Done. An offline calender will add roughly $200,000 to the price of a printer. That’s pretty simple math. When you consider the power consumption on a 16-foot heat press as well as scheduled maintenance on an additional machine, the total cost for that calender gets even higher. A 5-meter printer and a 5-meter calender take up a lot of space. 412 square feet of space to be exact. That’s more than double the footprint of the D5300 DS which is 194 square feet. * And that 412 square feet is for the equipment alone. It doesn’t take into account the space around the machines required for loading and unloading. This might not be a problem for larger shops, but wouldn’t you rather use that extra space for something with a better ROI? For all these reasons, we believe now is the ideal time to get into 5-meter dye sub printing. And by doing it with the PrinterEvolution D5300 DS, you can avoid the typical barriers that come with it. Call or email our equipment specialists today to learn more. * EFI VUTEk Fabrivu 520 and Monti Antonio 91-5400 used for these examples.